India's colonization supplied Europe with raw materials and a market for its exports for centuries, a commercial exchange that would closely entwine the economies, cultures, and people of India and Britain. 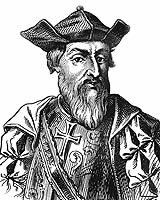 Vasco da Gama's 1498 arrival in India established a sea route from Europe, and during the following centuries, the Dutch, British, Portuguese, and French would build settlements in port cities throughout the region. The collapse of the Mughal Empire in the eighteenth century after the reign of Aurangzeb left a power vacuum that the British East India Company and the French East India Company were eager to fill. 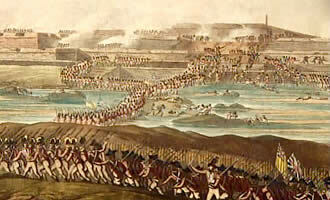 By the late 18th century, the French had lost power in the region, and the British dominated trade through protectionist measures that required Indian exports to be transported on British ships. The British focused on consolidating their sovereignty, acquiring lands by military conquest and by exploiting divisions among Indian states and religious groups. British territory included the Punjab province and lower Burma (which would come under their complete control in 1886), and the British spread new technologies such as the telegraph, railroad, and steam transportation throughout the region. 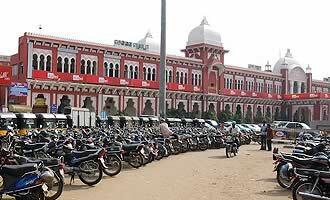 This transportation network continues to flourish and grow to this day, as evidenced by the Chennai Central Railway Station. After the violence of the Great Rebellion of 1857, Parliament transferred the administration of the region from the British East India Company to the Crown, initiating the era of the British Raj, which would end in 1947 with India's independence. In 1604, a charter granted by King Henry IV established France's first trading company in India, but the venture never gained traction for lack of funding. In 1664, King Louis XIV's finance minister, Jean-Baptiste Colbert, revived the company with money from the royal treasury and by granting trade monopolies to investors. Between 1664 and 1789, the company would be restructured and renamed repeatedly, known variously as the French Company of the East Indies, Company of the Indies, French Company of the Indies, and the Perpetual Company of the Indies. Weak rulers of the Mughal Empire and the empire's gradual dissolution created conditions conducive to France's rise to power. 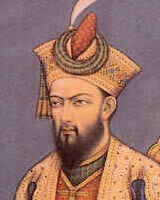 (Although remnants of the great Mughal Empire would continue into the nineteenth century, the empire effectively fell in 1707 with the death of its last emperor, Aurangzeb.) The French established a capital at Pondicherry (now Puducherry) in south India, where silk and textiles were collected from surrounding regions, and founded trading posts at Surat, on India's central west coast, and Chandannagar (or Chandernagore), in the northeast. Mauritius became a French colony in 1721 and Mahé followed in 1724. By the 1730s, the French Company had been granted nawab, or local governor, status that gave them authority to collect land revenue, maintain an army, and mint rupees. The British East India Company and the French Company both tried to consolidate power through control of the local princes. Vying to gain dominance in trade and place their own candidates in positions of power in the key posts of Hyderabad and Arcot, England and France fought the Carnatic Wars (named for the region in southern India) intermittently between 1746 and 1763. England's victory over France in the final Carnatic War and the Seven Years' War led to the end of France's power in the region, though they retained Pondicherry until 1954 and French is still an official language in the local legislature. The Chennai Central Railway Station, commissioned in 1873 and opened around the turn of the 20th century, is South India's central railway hub. Chennai (formerly called Madras), known as the "Gateway of the South," was founded as a British trading post in 1639, and became an administrative and commercial capital of the British East India Company. The station initially had four platforms; subsequent additions in the 1930s and 1950s increased the number of platforms and amenities for the growing numbers of passengers. The red brick structure with a white roof and landmark clock tower reflects Gothic and Indo-Saracenic elements. 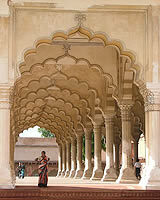 The Indo-Saracenic style of architecture, pioneered in Madras, was developed by British architects in India during the late 19th and early 20th centuries. Buildings built in this style combine Muslim designs and Indian materials and may feature pavilions, vaulted roofs, towers, and minarets. Why did the British push the development of railroads in India? 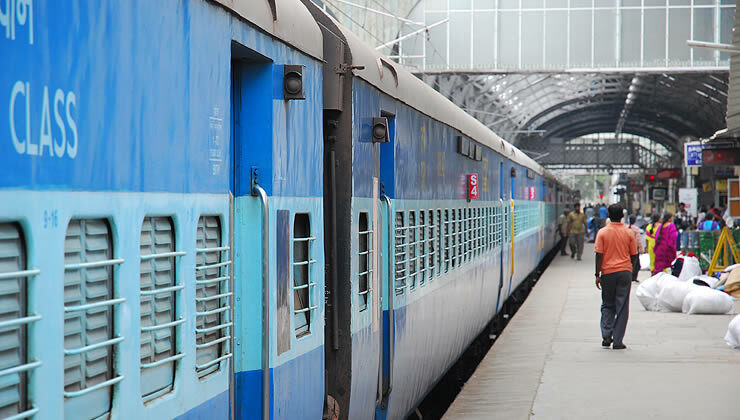 What was the practical and symbolic nature of a British controlled railroad system in India? Why is the bureaucracy the British created to control India considered impressive? Why did the British allow the Indian National Congress to start meeting? 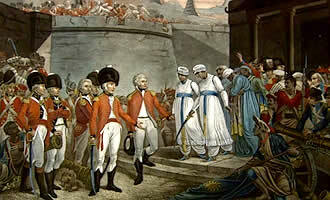 Evaluate the new power of British Empire after the defeat of the French in India, North America, and Europe in 1763.